You are here: Home / Blog / Homeschooling / What About Homeschool Socialization? It’s often the first question out of the mouths of non-homeschoolers. For homeschoolers, it’s the question they wish they never had to hear again. As a new parent with homeschooling friends almost 2 decades ago, I asked it. As a homeschooler with young children in an area where homeschooling was prevalent, I had pat answers. As a more experienced homeschooler with a wider exposure to people in many geographic and social settings, I wanted to take a second look at the question of socialization with some input from another experienced homeschooler, Jeanne Faulconer. 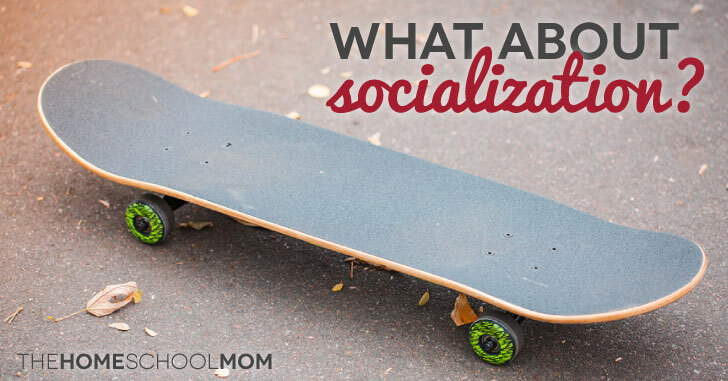 What do you want socialization to look like for your child? Ultimately that will answer the “what about homeschool socialization” question. To fit in with his peers? To respect and be kind to others? To act appropriately in any given situation? To advance in society? Most people would say that they want their children to learn to function in a group setting, to learn respect for others, and to have the ability to get along with people of all ages, both genders, all races, and every socioeconomic group. Neither public school nor homeschooling is the source of those things. Instead, it is about how you parent and with whom your child spends time. Are there some homeschoolers who are socially awkward? Are there some public schoolers who are socially awkward? The answer to both is yes. And since bullying is one of the many reasons that people decide to homeschool, it stands to reason that some of those socially awkward students find their way to homeschooling for that very reason, and at home they are much more likely to be safe, respected, and able to develop into adults who aren’t broken by their childhood experiences. The socialization that goes on in the school system can be, but often is not, beneficial to students. Children are exposed to others their own age for hours a day with only one or maybe two adults per 25 or 30 students. As good a role model as a teacher or aide may be, they cannot provide more of an influence than the peers that outnumber them. They learn peer-dependence and respect their peers more than their parents or teachers. Students in large groups tend to long for peer approval far more than the approval of the adults in their lives. Seeking peer approval can lead to better academics for those who have a naturally competitive nature and better character for those that have friends who are a good influence, but it can also result in children grouping themselves with like children and teasing and harassing those who are different or developing bad habits from negative influences. Some refer to homeschoolers as “hothouse transplants” when they move into the real world, but nothing could be further from the truth. It is the institutions that are the hothouses, with age-segregated classes that encourage cliques based on popularity or socioeconomic status. When high school students graduate and move into college and jobs, they often suddenly find that the status they had among their peers makes little difference in this new environment. The same can be true for homeschoolers if they have not been encouraged to have interactions outside of their own family, so it is important for families to consider that as their children mature. None of this is to say that homeschooling has no effect on a child’s socialization. Homeschooling in a rural area can be more difficult than homeschooling in a suburban or urban area where there are lots of activities available. Homeschoolers in rural areas may have to be more creative about finding opportunities for their children outside of the home, but it can be done. Many travel to larger cities for activities (try taking advantage of phoneschooling if you find yourself away from home frequently) or start their own co-ops and support groups. Homeschooling often requires initiative and creativity. In rural areas where other homeschoolers are not the solution, non-homeschooling experiences might be. Homeschoolers in that situation should consider social opportunities around volunteering and apprenticeships, which are often available in rural communities when large homeschool groups are not. Through volunteer work and apprenticeships, knowledge can be gained while socializing with others who share a similar passion. For some homeschoolers, the early high school years can be a particular social challenge, with many of their formerly homeschooled friends deciding to attend high school — again, especially a problem in less populated areas. Once they can attend community college at 16 or so and have a drivers license with its access to the wider world, this social challenge frequently seems to vanish, but parents will want to give thought about how they will help bridge the 9th/10th grade years if it’s possible that many long-time friends will be going to school. Team sports and socializing around interest areas rather than homeschool groups are a couple of ideas. Some parents and kids are worried about missing social milestones like prom or graduation. It’s not unusual for homeschoolers to attend proms as guests of their friends who are high school students, but you might be surprised to know that homeschool proms and graduation ceremonies planned by the participating families are becoming more and more common. If there is a social milestone that is important to your homeschooled child, you might have to organize it. Ultimately, socialization, like many other aspects of homeschooling and public school, is dependent on the child and the influences in their environment. Thanks to Jeanne Faulconer for her help with this post. I just need to know more about mentor/ job opportunities for my stepson. He has been homeschooled since he became a high school student. He has been sheltered, and does not have social skills or get to engage with other teenagers. His personality is not outgoing and he wants to become more socially inclined. I want nothing but the “best” for him and believe he could thrive in a more social environment. I have gotten him information to study for his learners and spoken with his dad about drivers lessons. This isn’t my child but I have raised four children some college educated and the others with good jobs. I’m passionate about children especially ones that will be young adults very soon. His mom has refused to allow him to play sports because it is classified as bad. He does not have any friends Oran outlet of any kind. His dad doesUber then goes to work in the evening. He does his studies, and has very limited excess to television, he is in counseling, supervised on everything and dragged along week after week to field service and religious studies. So, who or what can you recommend for this young man that is drowning in his life, but not thriving to be successful in his future. We live in the District of Columbia and I am passionate about children. I am not questioning anyone’s parenting skills butI gave my kids everything that I felt I didn’t have or needed by any means whether they chose to utilize it or not. I’m just a outsider looking in and I have talk with him , so he wants to be more social with peers as well as others I am grateful for any information to assist him in any way. Do what is right for you and your family. Children should feel safe and loved in order to grow successfully and be healthy. Without that they end up reaching for dangerous outlets as they become teenagers. What about students with separation and social anxiety. I am a grandparent with limited resources raising two grandchildren. One took to public school swimmingly but the older one is cheerful at home most days but the minute we get to school she clings and cries….maybe stays in school 3 out of 5 days. I have been told (by the school and pediatrician) that homeschooling would be a mistake and not get to the root issues or teach her how to navigate socially but I feel like home is her ‘safe’ haven and why not use that safe place to let her find her way in the world. Do you have any information on how students with anxiety issues fare being home schooled? You had such a great question that I decided to answer it at length as part of my Ask Jeanne series. You can read my response at Ask Jeanne: Homeschooling and Social Anxiety. Good luck with your granddaughter! Wanted to connect with other families in Billings, Montana so my son can meet some peers. Also wanted to join a co-op which will hopefully connect us to joining sports where other 12 yr. olds are involved. Please provide me with some info. Or contacts. Appreciate it! Hi Mary – The only groups we know of are listed on our Montana pages. State and local groups are here, and sports groups are here. You can also check for academic opportunities here.